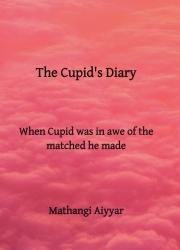 Description of "The Cupid's Diary"
This book is a collection of short love stories. Each story with a different flavor of love. Even Cupid could not stop himself from sharing these stories. Mathangi Aiyyar is a 23 year old hailing from Mumbai. Mumbai- where the honks of the cars stuck in the traffic is music; where the Vada Pav is a staple fast food; where in a crowded local train someone randomly smiles at you and you smile right back at them, making your day and theirs; where no one went to sleep hungry. Writing has been her hobby from eternity. It gives her peace. She has always wanted to show the readers, the world that she created where the characters were her best friends. At the age of fourteen, her poem - My Little Sister- got published for the first time in the children’s edition of a local newspaper. Reviews of "The Cupid's Diary"